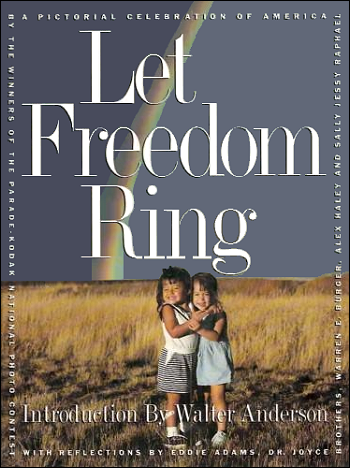 Let Freedom Ring has 100 stunning photographs chosen by Parade magazine and Eastman Kodak as the best images of the freedom Americans cherish. Reflections by the judges—photographer Eddie Adams, newspaper columnist Dr. Joyce Brothers, the late Alex Haley, retired Chief Justice Warren E. Burger, and talk-show host Sally Jessy Raphael—make this a most inspiring gift book. Eddie Adams has won 500 photography awards, including the Pulitzer Prize, in over 35 years as a photojournalist. Dr. Joyce Brothers wrote a syndicated newspaper column for 350 daily newspapers, authored magazine articles, including several books, and advised several manufacturers on women’s needs. First known for his work as co-author of the highly regarded Autobiography of Malcolm X, Haley’s biggest success stemmed from his Pulitzer Prize-winning book, Roots: The Saga of an American Family. Extensively researched and based in part on Haley’s own African roots, the work became a national bestseller. In 1953 Warren E. Burger was an assistant US Attorney General for the Justice Department’s Civil Rights Division. President Eisenhower later moved him to the Court of Appeals for the District of Columbia Circuit in 1956. On June 9, 1969, the Senate approved Burger’s nomination by President Nixon to the high court. Sally Jessy Raphael is best known as an American talk show host. Her show, Sally, debuted on October 17, 1983 to overwhelming public favor and continued airing for nearly two decades. Any national photographic contest that is open to all corners inevitably will produce what amounts to a mirror of not only the faces but also of the spirits or, one might even say, of the “flavor” of the populace of that country. This has been impressed upon me most powerfully as a result of my taking part in the judging of the entries for Parade magazine’s “We The People Photo Contest,” which was the basis for this book. As I thumbed through stacks and stacks of photos, sorting out one after another with great reluctance—there were so many I liked so well and I hated to put them down but I had to make choices—I thought a number of times about a trip I made to an Iron Curtain country and about the pictures I had seen at a photo exhibit there. The country had recently held a contest similar to Parade’s and all the photos were on display and the hosts beamed with pride at their cultural display. But the pictures were formal and postured, and the faces were staring and those that were smiling seemed to do so with uncertainty. How different were these I was judging! They were faces, old and young and in-between, of an unfettered people, free and open and, it was clear, unafraid of taking chances. These photographs frequently all but sang with their spontaneous laughter and happiness and gaiety. Even solemn elders often reflected a twinkle. I was, I am, very moved when I reflect that what I have “judged” is the buoyant face of America. ~ Alex Haley.